Electricians and plumbers both must be licensed to perform any type of work whether it is commercial or residential. So why would cabinet companies even consider doing either of these trades tasks? Cabinet bids should never include plumbing or electrical, unless you are going to sub-contract the work out to a licensed and insured business. If for any reason at all you decide to take on the work of either of these trades, make sure that in your bid you spell out what your responsibilities will be. Remember that there is always the possibility of needing to hire an insured professional if something goes wrong. In such cases, you must spell out the details to your customer, before hand in your bid, as to who will be responsible for paying the plumber or electrician if they must be hired to finish what you have begun. Several years ago I agreed to remove a kitchen sink for a customer. I explained that I would remove it, but not reinstall the sink. This is where I learned an expensive lesson. I was scheduled to do a Formica countertop resurface on a Saturday. The first thing that I needed to do was remove the existing sink. Obviously, this required that I turn off the water. As I was trying to turn off the hot water valve, it refused to budge due to not being shut, but remaining open for so many years. The valve actually had major signs of corrosion all around it. After much toiling, the hot water shutoff valve was finally closed. I removed the sink, completed the countertop recover job and was paid promptly by my customer around four in the afternoon. I received a call sometime about 7:30pm from the customer. They told me that there was evidence of water leaking on the front porch area directly on the other side of the wall where the sink kitchen sink plumbing was located. I quickly drove to the house to investigate. Four hours later and $350 dollars gone from my wallet, the plumber had finally finished repairing the leaking pipe inside the wall. Guess who did not have a clause in the contract that stated, if there arose a need to hire a professional plumber, the customer would be responsible to pay for their services? The money I had made on the recover job all went to pay the plumber. Since then, I always explain to my customers that commercial liability insurance for cabinet companies does not cover plumbing or electrical workmanship mistakes that I would make. That’s why they will need to hire a company that is licensed and insured to perform the required work at hand. Doing the work of a licensed electrician or plumber is dangerous when your profession is cabinetry. What I have discovered is that even though customers would like to save a few dollars by not hiring the proper tradesmen to complete the necessary tasks, they will respect your recommendation to hire a professional. 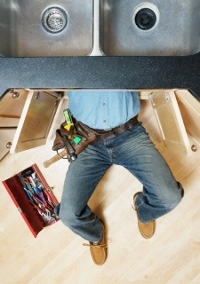 Cabinet bids should not include doing work that legally requires a licensed tradesman. Leave the tough stuff for the guys who had to go to school for it.